My first visit to a farm seems a million years ago and yet it also seems like yesterday. 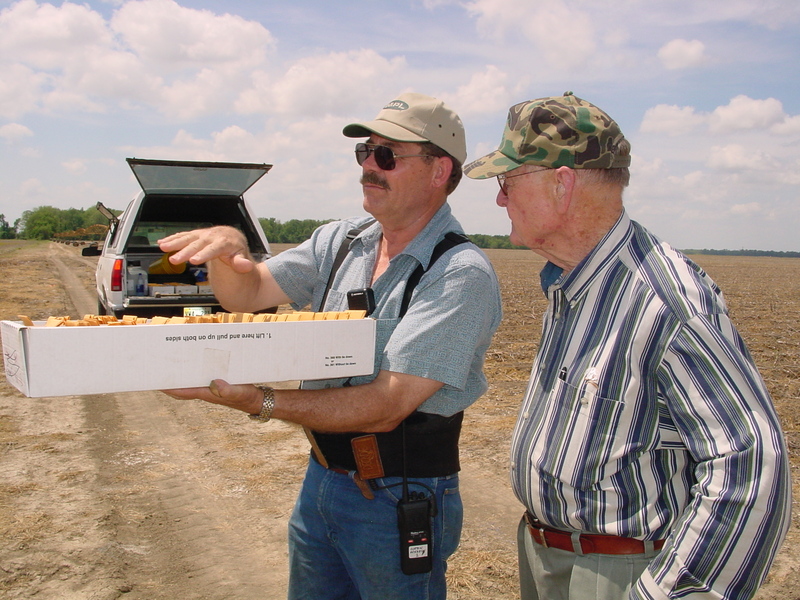 The farmer to host me for my first real farm visit, while I was in graduate school was Mr. Ray Young. I can’t imagine how often he and his wife Mrs. Dorothy have come to mind over the years. This post will be far more story than profile cause I shared a bit of the story this weekend for a work event and it makes me smile to tell it. 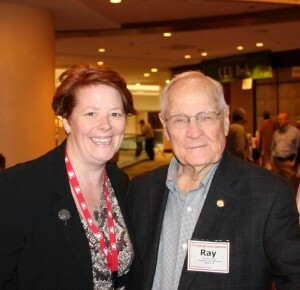 Mr. Ray won my heart… he’s one of the people who helped me decide agriculture was for me. It has been too long since I visited the Youngs farm in Wisner, LA but I have photos from one of those times around this time of year. Mr. Ray was planting cotton. But that first visit… that one is much more vivid in the photos in my mind. I can remember so much about it. My first visit was while I was working my way through graduate school. There were a lot of winter meetings going on and the editors at Cotton Farming had been traveling a lot and magazines were thick so there was lots to be written. I had worked for the company for a few years doing things in Memphis but had never gotten to travel for work. But there was a meeting in Monroe, LA that needed to be covered. A cotton expert from Russia was going to be there and since I had been learning Russian so it was decided I would go to that meeting and visit a farm while I was down there. It was cold and rainy… the typical winter conditions for the Mississippi Delta. I don’t remember getting to the farm, but I remember hopping in his truck and getting a tour. Since it was winter, there wasn’t much to see, but Mr. Ray spent the time showing me his farm fields and explaining what I was seeing. He had me so focused on the soils that I can still see them in my mind. He explained conservation tillage to me and helped me understand how he was getting it to work on his farm. He said that by creating raised beds a farmer can help channel water where they want it. He had been using the same rows for years, he’d just sure them up some each fall and let them mellow over the winter, collecting lots of moisture for the stale seedbed planting to come. He helped pioneer this version of conservation tillage as the beds would help him keep the seed in moisture but he didn’t want it too wet. We looked at the ridge that came through his area. He helped me think through the fact that meant soils on his farm varied widely. We talked about the silt loams closer to the river that were so great for cotton and the heavier clay soils on the other side of the ridge. He told me about the benefit of other crops like soybeans and corn. By the time we got back to my car, it was close to noon. In all of our driving, I didn’t notice any restaurants or cafes. I had maps to help me make my way back north but have to admit, when Mr. Ray invited me to lunch at his house, I gladly said yes! That lunch — grilled cheese and tomato soup — enjoyed with Mr. Ray and his sweet wife Mrs. Dorothy was one major trigger for me choosing to pursue a career in agricultural communications. Looking at this photo of he and I at the Beltwide a few years ago I think you will notice a couple of things. He may have the sweetest face you have ever seen. And secondly, I can’t help but smile contagiously. 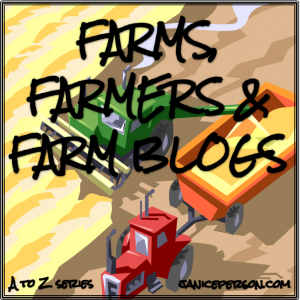 Tomorrow’s the Final Farms A to Z post! I wasn’t sure it would happen, much less on schedule, but we are finally at the end of the alphabetical series of pasts about farms and farmers. Make sure you come back tomorrow for the letter Z!